This paper shows part of the results of a study on the rhetorical use of values in the communication of corporate social responsibility in Chile: In particular, an analysis of the discourse applied to the letters from Chief Executive Officers (CEOs) which were included in the reports of the ten companies that led the Corporate Sustainability Ranking, prepared in 2017 by the Prohumana Foundation. To face this challenge, a model of rhetorical - communicational analysis that considers argumentation principles by values was elaborated (Perelman and Olbrechts - Tyteca, 1994, Bellenger, 1992).The results show that the letters are addressed to a particular audience (the stakeholders), that they are hybrid rhetorical expressions (of judicial and epidictic nature), and that specific values, such as responsibility and effectiveness, prevail in them. These values pretend to logically and ethically sustain the companies’ argument or story, implying a level of agreement: The reader is committed not to discuss or deny himself in the existence of the validity of values and, from that perspective, he aspires to eliminate resistance or criticism of financial, environmental and social management. In this sense, the premise that sustainability reports are representative texts of corporate identity and strategies is confirmed. magíster en Comunicación Estratégica y licenciado en Comunicación Social. En la UC imparte cursos sobre semiótica y discurso corporativo. Ha sido consultor en materias de comunicación estratégica y responsabilidad social para diversas empresas del sector industrial. pmatus@uc.cl Orcid: https://orcid.org/0000-0002-0307-7586. Acción RSE. (2014). Análisis de reportes de sostenibilidad 2013: aproximaciones a la gestión de RSE en Chile. Recuperado de http://www.accionempresas.cl/docs/estudios/1812115036_Reportabilidad_PARA_WEB.pdf. Aristóteles. (1999). Retórica (introducción, traducción y notas por Quintín Racionero). Madrid, España: Gredos. Austin, J. (1990). Cómo hacer cosas con palabras. Barcelona, España: Paidós Ibérica. Banco Santander. Chile. (2017). Informe anual 2016. Recuperado de https://www.santander.cl/nuestro_banco/pdf/Memoria_Financiera_Banco_Santander_2016.pdf. Bellenger, L. (1992). L’argumentation: principes et méthodes (4a ed.). París, Francia: ESF. Beristáin, H. (1995). Diccionario de retórica y poética (7a ed.). Ciudad de México, México: Porrúa. Breeze, R. (2013). Corporate discourse. Londres, Inglaterra: Bloomsbury. Brown, H. S., de Jong, M. y Levy, D. L. (2009). Building institutions based on information disclosure: Lessons from GRI’s sustainability reporting. Journal of Cleaner Production, 17(6), 571 - 580. Brown, H. S., de Jong, M. y Lessidrenska, T. (2009). The rise of the Global Reporting Initiative: A case of institutional entrepreneurship. Environmental Politics, 18(2), 182 - 200. Browne, V. P. (2010). Características de la cobertura informativa de la responsabilidad social empresarial en la prensa chilena. Cuadernos Info, (27), 123 - 135. Castelló, I. y Lozano, J.M. (2011). Searching for new forms of legitimacy through corporate responsibility rhetoric. Journal of Business Ethics, 100(1), 11 - 29. Cornelissen, J. (2004). Corporate communications. Theory and practice. Londres: Sage. Davidson, K. M. (2011). Reporting systems for sustainability: What are they measuring? Social Indicators Research, 100(2), 351 - 365. Derkxa, B. y Glasbergen, P. (2014). Elaborating global private meta - governance: An inventory in the realm of voluntary sustainability standards. Global Environmental Change, 27, 41 - 50. Elkington, J. (1998). Cannibals with forks: The triple bottom line of 21st century business. Isla Gabriola: New Society. Heath, R. L. (2001). A rhetorical enactment rationale for public relations: The good organization communicating well. En R. L. Heath (Ed. ), Handbook of public relations (pp. 31 - 50). California, Estados Unidos: Sage. Heath, R. L. (2008). Rhetorical theory, public relations, and meaning: Giving voice to ideas. In T. L. Hansen - Horn y B. D. Neff (Eds. ), Public relations: From theory to practice (pp. 208 - 226). Boston, Estados Unidos: Pearson. Heath R.L. y Frandsen F. (2008) Rhetorical perspective and public relations: Meaning matters. En: A. Zerfass, B. van Ruler y K. Sriramesh (Eds. ), Public relations research (pp. 349 - 364). Wiesbaden, Alemania: GWV Fachverlage. Humphreys, M. y Brown, A. (2008). An analysis of corporate social responsibility at Credit Line: A narrative approach. Journal of Business Ethics, 80(3), 403 - 418. Jumbo. (2017). Alimentando la sostenibilidad. Reporte de sostenibilidad 2016. Recuperado de https://www.jumbosostenible.cl/wp-content/uploads/2016/09/reporte - sostenibilidad - jumbo - 2016.pdf. Leszczynska, A. (2012). Towards shareholders’ value: An analysis of sustainability reports. Industrial Management + Data Systems, 112(6), 911 - 928. Lyons, J. (1984). Introducción al lenguaje y a la lingüística. Barcelona, España: Teide. Marafioti, R. (2003). Los patrones de la argumentación. Buenos Aires, Argentina: Biblos. Martin, B. y Ringham, F. (2000). Dictionary of semiotics. Londres, Inglaterra: Cassell. Mejri, M. y de Wolf, D. (2012). Analysis of retailers’ communication approaches in sustainability and social responsibility reports. International Journal of Marketing Studies, 4(2), 30 - 44. Moneva, J. M., Archel, P. y Correa, C. (2006). GRI and the camouflaging of corporate unsustainability. Accounting Forum, 30(2), 121 - 137. Morandé, P. (2005). Bases conceptuales para el estudio de la responsabilidad social de la empresa. Abante, 8(2), 3 - 36. Organización de Naciones Unidas. (1987). Report of the World Comission on Environment and Development. Recuperado de www.un-documents.net/our-common-future.pdf. Perelman, C. y Olbrechts - Tyteca, L. (1994). Tratado de la argumentación. La nueva retórica. Madrid, España: Gredos. Pérez, M. y Vega, O. (2002). Enseñanza del discurso argumentativo. La argumentación por valores. Onomázein, (7), 403 - 411. Prohumana. (2017). Ranking de sustentabilidad empresarial Prohumana: modelo de estrategia de negocio sustentable. Recuperado de http://www.prohumana.cl/ranking_sustentabilidad_empresarial/wp-content/uploads/2017/02/Metodolog%C3%ADa-PROhumana-2017.pdf. Retamal, L. y Matus, P. (2018, junio). 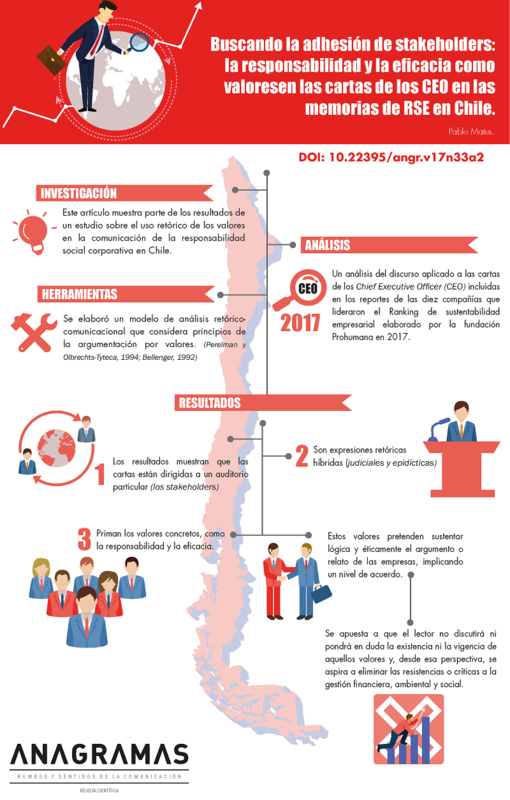 Relacionamiento de empresas generadoras de electricidad en Chile y sus stakeholders: Un análisis a partir de reportes de RSE. Trabajo presentado en el I Congreso Internacional de Comunicación para la Sostenibilidad, Cuenca, Ecuador. Simnett, R., Vanstraelen, A. y Chua, W. F. (2009). Assurance on sustainability reports: An international comparison. The Accounting Review, 84(3), 937 - 967. Tironi, E. y Cavallo, A. (2007). Comunicación estratégica. Vivir en un mundo de señales. Santiago de Chile: Taurus. Van Riel, C. (1997). Comunicación corporativa. Madrid, España: Pearson Educación. Vigneau, L., Humphreys, M. y Moon, J. (2015). How do firms comply with international sustainability standards? Processes and consequences of adopting the Global Reporting Initiative. Journal of Business Ethics, 131(2), 469 - 486. Zhang, J. y Swanson, D. (2006). Analysis of news media’s representation of corporate social responsibility. Public Relations Quarterly, 51(2), 3 - 17.